Crochet animal applique patterns can be used on so many different types of projects to quickly make anything extra cute. You can attach them to baby blankets, clothing, hats and more. They can be attached to other crochet projects or added to items that you've sewn or bought. ​Animal appliqués can also be used on their own to create bunting, coasters, wall art and more. Sarah of Repeat Crafter Me has designed a terrific set of alphabet animal crochet patterns, all available for free, that can be combined together to make an adorable teaching set for children. Each letter is represented by an animal whose name starts with the letter. Every single crochet pattern in the collection is cute and it stands on its own, so you could also pick and choose the letters to spell out names and other words for decorating. For example, if you just want an elephant appliqué crochet pattern, you could use the pattern intended for E.
Tip: Learn how to attach a crochet appliqué. There is one crochet appliqué pattern for each letter of the alphabet. Each letter represents an animal. For example, A is for alligator and M is for Monkey. A few of them are particularly creative, such as U is for Unicorn and X is for X-ray Fish. Sew them into a fabric book to teach children the alphabet. Attach a few to a child's t-shirt. Have fun with these! A is for Alligator. The cute alligator makes a great start for this project. B is for Butterfly. Butterflies always make great animal appliqués for crochet projects. C is for Cat. Teach kids the letters of the alphabet using simple animal appliqués like the cat and dog. D is for Dog. Add a dog applique to a blanket for a cute gift. E is for Elephant. There are so many fun projects for elephant crochet patterns, especially in nurseries. F is for Fox. The fox is one of the trendiest animals to crochet. G is for Giraffe. The long-necked giraffe is a fun one to crochet. H is for Hedgehog. The great thing about this set of animal patterns is that some of them are for more unique animals like the hedgehog. I is for Iguana. 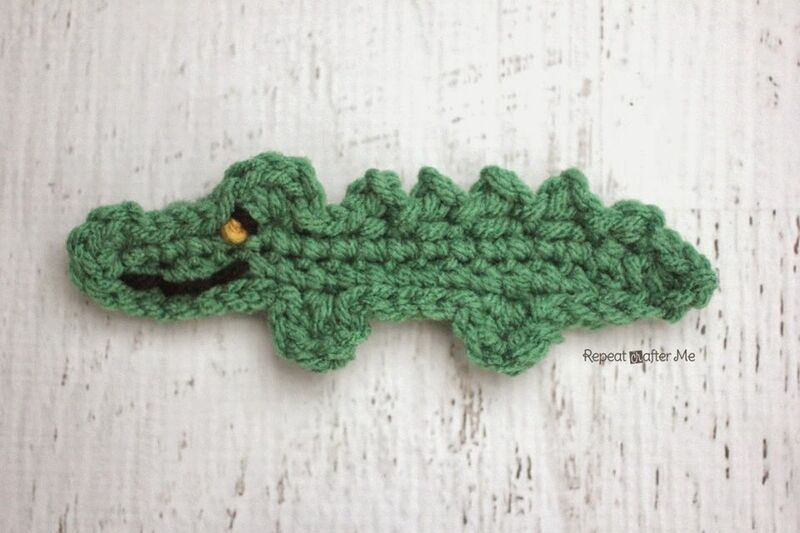 Don't leave out the reptiles when making crochet animal appliqués! J is for Jellyfish. Make sure you include underwater animals like the jellyfish, too. K is for Kangaroo. Each crochet animal applique has its own unique details. L is for Lamb. Some patterns are great for holiday projects, like the lamb for Easter designs. M is for Monkey. Crochet monkey patterns often make people smile with their cuteness. N is for Nightingale. There are a few birds included in this set of animal appliqués including the nightingale. O is for Owl. If you're looking for a larger bird, this is a good choice. P is for Penguin. The penguin crochet applique is a cute addition to winter crochet projects. Q is for Queen Bee. In contrast, the bee is perfect for spring and summer projects. R is for Rabbit. The rabbit, like the lamb, is a smart design to bookmark for Easter crochet projects. S is for Snail. Have you crocheted a snail before? This is your chance. T is for Turtle. You'll smile as you craft this cute crochet applique. U is for Unicorn. Brighten up any project when you add a unicorn applique. V is for Viper. You might have been disappointed to see S for Snail instead of Snake but you'll find a snake crochet pattern in here after all. W is for Whale. Add a whale applique to washcloths to make bathtime more fun. X is for X-ray Fish. This is a delightful unique crochet pattern. Y is for Yak. You could use yak yarn to crochet this yak pattern! Z is for Zebra. You've worked your way through the whole alphabet. These crochet appliqués are small so they can be worked up quickly. Many of the crochet animals have cute little easy-to-stitch-on faces that make them especially adorable. You can add them to a variety of different items like tote bags or T-shirts. It might be fun to create a crochet animal wall display in a kids' room. The possibilities seem endless! At the beginning of each crochet pattern, Sarah shares some suggestions for what she might do with that particular pattern. For example, she notes that the crochet jellyfish pattern could be used to create a set of jellyfish strung together for a sea-themed party. Her ideas are a great starting point, which you can use a springboard for your own projects. Sarah provides one full crochet pattern for each of the 26 appliqués. Her crochet patterns are clear, easy-to-read, and professionally written. She includes photos (although not full photo tutorials) for each of the crochet patterns so that you can see what they should look like. This could be a great one-per-day craft project or stretch it out, making one applique every two weeks to complete the set in one year. Find the free crochet alphabet appliqué patterns on Repeat Crafter Me.